- Number of positive tests for Lyme disease increased significantly between 2016 and 2017. - Historically concentrated in Pennsylvania and New England states, Lyme disease has been detected in each of the 50 United States and the District of Columbia. - Outside of the northeastern U.S., California and Florida - states not historically associated with significant rates of Lyme disease - saw the largest absolute increases in positive Lyme disease test results. - Notable increases also observed in Georgia, Arizona, Ohio, Texas, Tennessee and Virginia. SECAUCUS, N.J., July 30, 2018 /PRNewswire/ -- The prevalence of Lyme disease is increasing in the United States, spiking significantly between 2016 and 2017, and has spread to all 50 United States and the District of Columbia, according to a new study released today by Quest Diagnostics (NYSE: DGX). Based on more than six million de-identified laboratory test results conducted over the past seven years, the Quest Diagnostics study also found that outside of the northeastern U.S. which is historically associated with Lyme disease, California and Florida saw the largest absolute increases in positive test results. California found 483 infected patients in 2017, a 194.5 percent increase over 2015 levels. Florida found 501 infected patients in 2017, a 77 percent increase over 2015 levels. "Lyme disease is a bigger risk to more people in the United States than ever before," said Harvey W. Kaufman, M.D., senior medical director for Quest Diagnostics and head of the company's Health Trends research program. "Our data show that positive results for Lyme are both increasing in number and occurring in geographic areas not historically associated with the disease. We hypothesize that these significant rates of increase may reinforce other research suggesting changing climate conditions that allow ticks to live longer and in more regions may factor into disease risk." 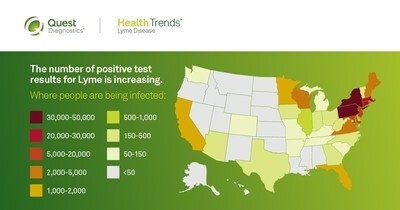 Lyme disease remains most prevalent in the Northeastern United States Combined, Pennsylvania and the six New England states (Connecticut, Maine, Massachusetts, New Hampshire, Rhode Island and Vermont) accounted for 60.6 percent of the total number of positive Lyme disease test results found in the United States in 2017. Pennsylvania tops the nation in Lyme disease cases. With 10,001 cases in 2017, Pennsylvania saw the most positive Lyme disease test results of any state in the nation, and nearly as many found in all New England states combined (11,549). Notable increases also observed in other states between 2015 and 2017 including Georgia, Arizona, Ohio, Texas, Tennessee, and Virginia. Spread by tick bites from infected blacklegged and deer ticks, Lyme disease is an infection by the bacterium Borrelia burgdorferi that causes more than 300,000 illnesses each year in the United States, according to the Centers for Disease Control and Prevention (CDC). It is the most commonly occurring vector-borne disease and the sixth most commonly reported notifiable infectious disease. Common signs of potential Lyme exposure include the tell-tale "bullseye" shaped mark that frequently forms on the skin at a tick-bite location, or a presence of flu-like and/or other symptoms associated with Lyme or tick-borne infections. Physicians who suspect their patients might have been exposed to the bacteria causing Lyme disease can order laboratory tests to confirm the presence of Lyme or other tick-borne diseases. The Quest Diagnostics Health Trends™ report analyzes results of immunoglobulin G (IgG) antibody testing. This immunoblot test can help identify antibodies produced by the body in response to infection. In recent years, other tick-borne diseases have emerged in addition to Lyme disease. These conditions may share common symptoms but require different therapies, challenging accurate diagnosis and outcomes. This summer, Quest introduced a new test service that helps identify infection of Lyme disease and four other tick-borne infections from a single patient specimen. This test uses advanced technologies, including qualitative real-time PCR, to identify the DNA of each infectious agent. Quest also offers a test that detects antibodies and if positive or equivocal is confirmed by immunoblot. This study examines patterns and trends in laboratory test data performed by one or more Quest Diagnostics laboratories in the United States. The study's strengths are its size and national scope and use of an objective laboratory method, versus surveys or polls, which may be subject to user misrepresentation or error. Study limitations include geographic disparities and inability to confirm laboratory findings through access to medical records or clinical evaluation. The Lyme disease analysis evaluated results of IgG which may identify current or long-standing infection, including post treatment. Physicians order IgG testing for patients suspected of Lyme disease, and consider results, symptoms and other factors to make a diagnosis. Quest Diagnostics Health Trends studies are performed on aggregate de-identified data in compliance with applicable privacy regulations and the company's strict privacy policies, and following procedures approved by the Western Institutional Review Board. Quest Diagnostics manages the largest database of de-identified clinical laboratory data, based on 44 billion laboratory test results. From this data, the company derives clinically significant insights that empower patients, healthcare practitioners and policymakers to improve health. Developed in collaboration with top researchers and institutions, Quest Diagnostics Health Trends studies are published in peer-reviewed medical journals and by the company as a public service. Quest Diagnostics Health Trends reports have yielded novel insights to aid the management of allergies and asthma, clinical (prescription) drug monitoring, chronic kidney disease, diabetes, heart disease, influenza and wellness. The company also produces the Drug Testing Index (DTI)™, a series of reports on national workplace drug positivity trends. QuestDiagnostics.com/HealthTrends.